Writer/director Kimble Rendall has the unique ability of taking ridiculous premises and turning out a pretty enjoyable movie. That was definitely the case with Bait which saw a group of people locked in a supermarket with great white sharks, and it's also the case with his latest project 7 Guardians of the Tomb which falls somewhere between an Indiana Jones adventure and Arachnophobia. 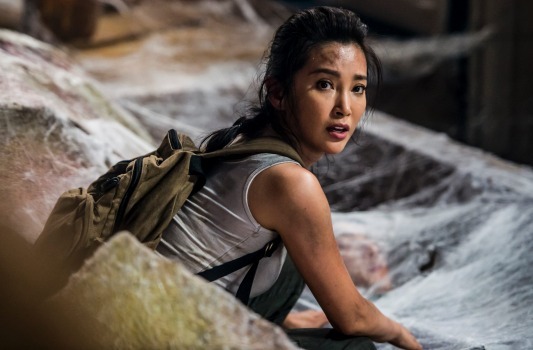 The movie stars Binbing Li as Jia, a woman who takes off to China along with family friend Mason (Kelsey Grammer) who has his own ulterior agenda, in search of her brother Luke who has disappeared after discovering the well preserved mummy of a Chinese emperor dating back to 200BC. 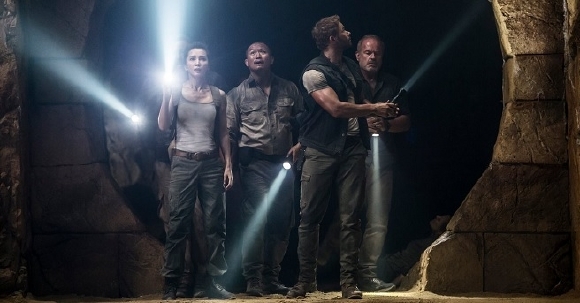 Once on the ground, Jia and Mason are joined by a team of experts including Jack Ridley (Kellan Lutz), an expert in getting people out of bad situations. The movie wastes no time getting into the action and though it stars with a rather mediocre explosion effect, the movie does overcome the effects limitations with a fairly interesting, if familiar, story, some great chemistry and one-lines and particularly, the endless amounts of spiders which make an appearance at nearly every turn. 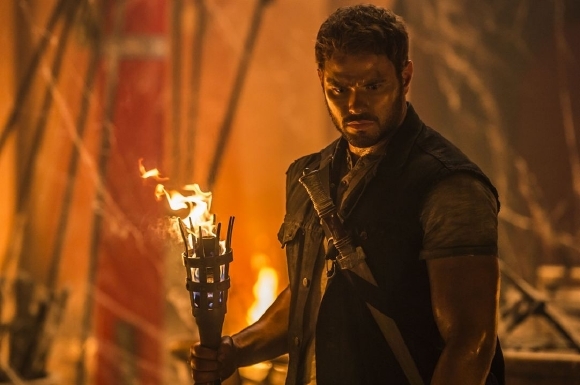 I had a chance to speak with Kellan Lutz about making 7 Guardians of the Tomb which continues to cement his career as action star, and we started with a trip to his childhood where his passion for action movies started. 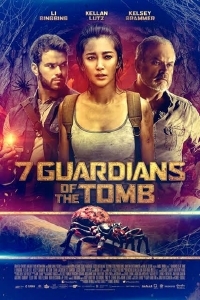 7 Guardians of the Tomb opens in theatres and will be available on VOD, and Digital HD on February 23rd. Before we get into 7 Guardians of the Tomb, I wanted to find out how you got to this point in your career. When did you realize the action genre was where you wanted to work and make a name for yourself? It goes back to when I was a child. I grew up with five brothers so it felt like every day was an action movie; all the boys beating each other up. All of the stunts we pulled so I grew up developing a thick skin. I always felt drawn to action movies and even working on Expendables 3... I didn't see them as Sylvester Stallone or Jason Statham but instead as Rocky or Blade or He-Man, all the characters I grew up loving. Now I'm playing the hero. I like fighting against the bad guy and righting the wrong. Does your love for action movies guide the roles that you take on? I like switching it up a little bit but I think I've made a name for myself in the action world and I love doing it so whenever a script comes my way, it's definitely something I consider. I love doing my own stunts, shooting guns, riding motorcycles - it all feels very organic to me. What was it about 7 Guardians of the Tom that appealed to you? Working with director Kimble Rendall. I met Kimble on a movie called Bait 3D. It was all about sharks and I was really impressed that he made that work. He did such a great job and he was just such a fun director during the press tour so when he mentioned he was thinking about making his next movie about killer spiders, I was into it. I was into what he would write and how it would turn out. When I read the script I thought it was a great homage and my version of Indiana Jones meets Arachnophobia. This also marks your return to Australia. How do you like working there? Everything. The people, the food. I love being close to the sea. I love the beer. I love it all. Was most of the movie shot on a set? Did you have any location shooting? We did shoot a little on location but we did have a big studio to shoot on and that was really great to shoot some of the more intricate scenes. There are a lot of spiders in the movie, really not for the faint of heart. I assume most of them are CG but what, if anything, did Kimble and the crew use on set to provide guidance during the scenes? They were toy spiders. Kimble had a few massive funnel-web spiders and a few others that he would hide in our scripts, in our shoes, in the trailers. He also used them in the scenes so we would have something to focus on. It was funny. He just loves goofing around. It sounds like it was a really fun set to work on. It was. It really was. We just had fun making a spider movie. A lot of fun. You can't take it too seriously. It was a really fun, enjoyable experience. Was it always the intent that this would be more tongue-in-cheek than serious? Oh definitely. It was written that way. You have your funny one-liners and some severe cases of Arachnophobia winks; the intent was always that it would be a fun, light experience. Are there any unscripted moments that made their way into the finished movie? Not action wise but there are a couple of one-liners that got slipped in there. You also manage to speak a little Chinese. Yeah, it was really cool. Working with Li Bingbing led to everyone learning a couple of words of Chinese. Hats off to her for doing a movie in a language where she goes back and forth between the two. I don't remember much of what they taught me but it's always fun to learn something new. There are quite a number of action sequences in the movie. Which one was the most difficult to shoot? Well, they were all pretty fun to do. Maybe the hardest one is the jump over the lava because there was a lot to consider when shooting it. We had to land in a certain spot and in a specific position. The last time we spoke you'd just wrapped Shane Abbess' The Osiris Child. Has there been any more progression on a sequel? I hope so. Shane has been working on a sequel and now it's about the financing. We'd all love to do it. Shane has such a brilliant mind we all want to see where he takes the story.